Well that was quite a 48 hours. Bode Miller Set For U.S. Open after Winter Olympics. 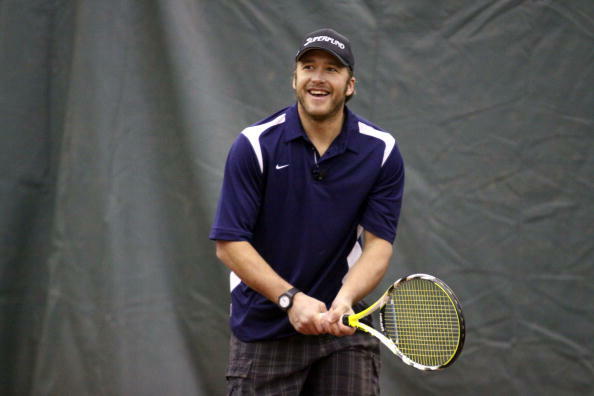 Bode Miller, the World Cup champion skier who hopes to win an elusive gold medal at this year’s Vancouver Winter Olympics, has set his sights on another prestigious sporting event – the U.S. Open. Miller has teamed up with the United States Tennis Association to promote the U.S. Open National Playoffs which expands the reach of the Grand Slam event by allowing anyone the chance to compete in regional tournaments starting this April for a spot in the qualifying round of the U.S. Open. Comments Off on Bode Miller Set For U.S. Open after Winter Olympics. Serena Slammed with Fine & Probation for U.S. Open Meltdown. Serena Williams will have to reach into her purse again as part of her U.S. Open meltdown this summer which cost her a $10,000 fine by the USTA and her title. According to the Guardian the Grand Slam administrator Bill Babcock announced Williams will have to pay another fine of $82,500, a record, and will also endure a “probationary period” at all four Grand Slams during 2010 and 2011. If she causes another “major offense”, the fine would increase to $175,000 and she would be banned from that year’s U.S. Open. Many fans and members of the tennis world had called for an outright ban of Williams for the upcoming Australian Open as many felt a monetary fine would not be a severe enough penalty for the multimillionaire. Williams, who is in Barbados for an exhibition, could not be reached for comment. Personally, even though this fine is still pocket change for Serena, the “probationary period” is a good enough warning to Serena to mind her ways during the upcoming Slams. It will be interesting to see how the media will treat Serena next year and if they will continue to bring up the story even if Serena minds her manners all year. Comments Off on Serena Slammed with Fine & Probation for U.S. Open Meltdown. Amelie Mauresmo, has ended her season as of today and is mulling retirement according to her website. Mauresmo, currently ranked 20th, has not played or practiced since her second round loss to Aleksandra Wozniack in the U.S. Open. I remember watching that match and thinking how blase Mauresmo looked throughout it. She did play well in New Haven the week before but since the U.S. Open she pulled out of all the Asian tournaments which is never a good sign. And if you go on the WTA’s site and try to look up Mauresmo on their “featured players” area, she doesn’t show up. You have to type in her name to pull up her profile. Does the WTA know something we don’t? Of course the word “retirement” as we all know can mean many things. But Amelie has always been one of those mercurial players that never quite lived up to her potential despite winning Wimbledon and Australia and being number one. If she were to retire, I can’t see her coming back ala Henin. However I do think she should try and stick it out for one more year and see how it goes. Mauresmo’s style of play is refreshing in a sea of grunting two-handed backhands and would be missed. According to the BBC, Roger Federer was fined $1,500 for unleashing the “S” bomb on live tv during his match against Juan Marin Del Potro in the U.S. Open Men’s Final. Federer, unhappy with the fact that Del Potro took too long to request a challenge, got into an argument with the chair umpire who at one point told Federer to “be quiet” which prompted the outburst. The BBC also listed other offenders who got fined during the event including Vera Zvonareva and Daniel Koellerer for obscenities, Daniel Neston who got tagged with a $3,000 fine for unsportsmanlike conduct towards a fan and finally, and the most obvious, Serena Williams for her meltdown during her semifinal. One wonders that when Fed hits thirty if he will morph into the “cranky old guy” upset that all the young punks have started to pass him by. Now that was a U.S. Open Final! The mere fact that Juan Martin Del Potro, who let’s face it, outside of diehard tennis fans, few had heard of until this weekend, was mentally and physically fresher than Roger Federer in the fifth set and after four hours of play was truly remarkable. Few gave the big man from Argentina much of a chance to even win a set. But Del Potro’s stunning 3-6, 7-6 (5), 4-6, 7-6 (4), 6-2 win is a fitting end to what has been a truly dramatic U.S. Open. It could have turned out much differently as Del Potro, clearly in awe of his first Grand Slam final played tentative tennis for a set and a half. His bad play only masked Federer’s sub par play, especially Federer’s first serve which was non-existent for the first set or so. But when Del Potro hit a forehand down the line late in the second set which was called out first then challenged to be shown that was in, it seemed to irritate Federer so much that he couldn’t regain concentration causing him to eventually lose the second set in a tiebreaker. Federer’s serve was his undoing throughout the match and although it got better, he simply had no answer for Del Potro’s atomic forehand which gave the big man 36 winners. We kept for Del Potro to self-destruct, especially after he double faulted twice to lose the third set, but his strategy of getting a high percentage of first serves in and then extending Federer in the rallies worked. Once the fifth set began, it was much like what happened in the Australian Open final as Federer just went away. By the end, Federer was all out of sorts, hitting wild errors, while Del Potro remained calm even though the crowd was getting very rowdy. When Del Potro finally served it out at 5-2, he fell to the ground. What happened to the “greatest player of all time”? Throughout the event, Federer looked good, but never great. Although he displayed true artistry in the Djokovic match, his other matches were at a lower level but he was good enough to get away with it. Federer almost did today but ran into a player who believed he could play better and did. Having beaten Nadal and Federer in the same Grand Slam, the first time that has ever happened, Del Potro has leapt from potential Grand Slam champion to the player to watch in 2010. If Del Potro will be able to handle this instant fame will be interesting as he is a very quiet guy and been under the radar for a long time. As for Federer, his reaction during the trophy presentation was odd to me. He was smiling. No crying or pouting like in previous losses. I’m sure he can’t believe he lost, but he didn’t looked destroyed by it. Perhaps winning the French Open and having twins this year has put things into perspective for him. Even the “GOAT” can’t have it all. Before her U.S. Open Women’s Doubles Final today, Serena Williams issued another statement on her website in which she apologized in more explicit terms about the incident during her semifinal match with Kim Clijsters. I want to amend my press statement of yesterday, and want to make it clear as possible – I want to sincerely apologize FIRST to the lines woman, Kim Clijsters, the USTA, and tennis fans everywhere for my inappropriate outburst. I’m a woman of great pride, faith and integrity, and I admit when I’m wrong. I need to make it clear to all young people that I handled myself inappropriately and it’s not the way to act — win or lose, good call or bad call in any sport, in any manner. I like to lead by example. We all learn from experiences both good and bad. I will learn and grow from this, and be a better person as a result. This response was probably required after the media, especially those working for ESPN, continually suggested that Williams suffer harsher penalties and even a default from the doubles final for her outburst. Serena and Venus Williams did go on to win the doubles final over the number one seeds Cara Black and Liezel Huber 6-2, 6-2. In the trophy presentation, Serena did thank the New York crowd for their support and mentioned the new statement. Patrick McEnroe of ESPN desperately tried to get Serena to say more about the incident which only got boos from the crowd. When he tried one more time, it was big sister Venus who stepped in and said, “I think we can tell from the crowd that it’s time to move on Patrick.” which prompted a big roar of approval. It remains to be seen whether or not Serena will suffer any more backlash or penalties from either the WTA or ITF. It’s very clear that the tennis media will try and wring as much out of this as they can since there’s nothing better to talk about as it’s basically the end of the season. The idea of defaulting Serena and Venus from the doubles was ludicrous since Venus had nothing to do with the incident. Suspending Serena from future events would not change what happened and only hurt the sport. Serena admits what she did was wrong and that it cost her a chance of defending her title. Talking about it ad nauseam will only take more attention away from the real story of the U.S. Open which was Kim Clijsters’s amazing comeback run to take the title.